I’ve been a proud team captain for Walk to End Alzheimer’s for five years. I walk for all those living with Alzheimer’s, including myself. I started having trouble with my memory in my 40s. I worked in a doctor’s office as a nurse and suddenly I forgot how to calculate inches to feet in height. Then, I couldn’t remember what shots were given at what age. Eventually, I forgot how to spell the doctor’s name. My family doctor performed a mini dementia test and referred me to a memory center, where I was diagnosed with younger-onset Alzheimer’s. I thought of my daughter – am I going to see her get married, or see any grandchildren grow up? I’m 56 years old, and my mom is my caregiver. That is one truth I never thought was possible. My sister reached out to the Alzheimer’s Association and I was connected with someone at my local chapter. I saw that there was a need for people who are in the early stages of dementia to meet and talk so I started the first Memory Cafe in Lancaster County. I’m also a mentor, speaking to people who are newly-diagnosed, and I raise awareness in the community by fundraising. One of the biggest ways I fundraise is through Walk to End Alzheimer’s. I enjoy watching Walk to End Alzheimer’s continue to grow every year. Seeing donations come in that will support caregivers and those living with the disease means so much to me. Every step taken during Walk to End Alzheimer’s is a step closer to a cure, no matter where you walk. I’m lucky to use some of the skills I used as a nurse to encourage others to join me and to educate the public. And I’m not only helping them – they are helping me. Here is what I know: Alzheimer’s is not just an old person’s disease. Alzheimer’s is not funny. Alzheimer’s is a disease of the brain, not a mental health issue. 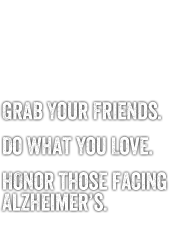 Alzheimer’s doesn’t care who you are or what you do. Alzheimer’s affects us all. Alzheimer’s diagnosis doesn’t mean you have to stop living. You still have a lot to offer to the community and a voice (and feet!) to help bring awareness to the disease. This is why I walk to end Alzheimer’s. About the Author: On September 24, Mary Read will walk in Lancaster, Pennsylvania to raise awareness and funds for Alzheimer’s research, care and support resources for local communities. She encourages people with Alzheimer’s and dementia to enjoy life every day. You can visit her team page here. My mom has been living with younger-onset Alzheimer’s for over nine years, diagnosed when she was just 53. This is why I walk to end Alzheimer’s. This year will be my fourth Walk in honor of her and the millions of people diagnosed with this disease. Some people mistakenly think that Alzheimer’s is a “cute” disease that happens to old people when they lose their memory. When I posted a video on Facebook last year of my mom barely being able to move without my support during the mother-son dance at my wedding, people got a better understand how devastating Alzheimer’s can be. It isn’t cute at all. And when you see firsthand what this disease does to someone you love, it makes you want to do whatever you can to fight the disease and help wherever and whenever possible. I’m also constantly inspired by my father, who has never wavered. Dad is there taking care of my mom 24 hours a day, seven days a week. He does anything and everything you can imagine and more for her, always with a smile on his face. This is one of the many reasons I’ve found my Walk experience to be so rewarding. I do it for my mother, who has the disease, and my father, her devoted husband and caregiver. Knowing that Alzheimer’s is the only cause of death in the top 10 in the U.S. that cannot be slowed, prevented or cured, the importance of walking and raising as much money as possible is beyond critical. My sister and her fiancé had been involved with the Walk in D.C. and it was their example that inspired me to reply to the email asking me to help out with the San Francisco walk two years ago. I started out as the chair of the sponsorship sub-committee, and this year I was lucky enough to be asked to co-chair the San Francisco Walk. I jumped at the opportunity! I was able to raise just over $2,500 last year, and my goal this year is to top $3,000. The most important thing anyone can do to raise funds is just ask. You never know which of your friends, family or coworkers might have a connection to the disease – or who just want to support you because they care about you! My wife Whitney and I discovered this quickly when we began our fundraising efforts, and it left us feeling so inspired. I walk for my mom and my dad. I also walk for me. I walk to raise Alzheimer’s awareness as much as I walk to raise money to put an end to husbands, wives, sons and daughters having to spend their lives caring for the people they love instead of enjoying the everyday moments that make life with those family members so special. I walk so that I can live in a future without Alzheimer’s. About the Author: Chris Reynolds is the co-chair for the San Francisco Walk to End Alzheimer’s. You can visit his team page here. Mark’s basketball career has spanned the entirety of our 20-year marriage. We have moved a lot – experiencing an ever-changing landscape of varying cities, schools, friends and basketball seasons, with invariable ups and downs. My role in Mark’s career has always been to find stability in these times of change, drawing from my relationship with my family. Some changes, however, are harder to face than others. Nearly nine years ago, my father died of younger-onset (early-onset) Alzheimer’s disease; he was 68 years old. Mark and I were living in Wichita, Kansas with our three young children – Will, 7; Ella, 4; and Leo, 1. I was devastated not only by my own loss, but the thought that my children would not grow up around my father. Both Mark and I are extremely close with our families and derive much of our identities and strength of character from the foundations of our childhood, specifically from our parents. I grew up in a close family – the kind that sat round the dinner table together and did family chores together. My dad was a huge influence on me and my siblings. I had a lot in common with him; we shared a love of cooking and wine, and enjoyed exercising our creativity. I credit my work ethic, loyalty and family-first mentality to him. Both my parents had always enjoyed sports, but it wasn’t until I fell in love with Mark that they fell in love with basketball. I was still in college when Mark and I began dating, so Mark met my dad when he was still himself, still the man who raised me, the ever-consummate business man. He and Mark forged their own relationship right away. There was a lot of mutual respect and admiration, a lot of overlapping drive for success despite odds and obstacles in both of their respective careers. Mark still remembers my dad that way. I am so grateful that he calls upon those memories when sometimes I struggle to remember the man he was before Alzheimer’s. I think of his state during the final years when he and my mother lived in Wichita, when I took on a major role in his caretaking and decision-making. While difficult, mine and my father’s bond was solidified during this time. When assisting my mother in his caretaking, my biggest challenge was not being able to help him when he was scared. Sometimes I would lose patience with him because you can’t “see” the effects of Alzheimer’s at first. He would look perfectly healthy and like his old self but wouldn’t be able to carry out a simple task like putting his coat on and getting in the car. I wanted to protect him and tell people he had Alzheimer’s because his behavior was so different from when he was healthy. He had always been this big, strong, brilliant, charismatic man and the disease took that away. My mom would always tell me that I had a way with him; he trusted and listened to me. I made him feel safe. That is by far the biggest reward – to give something back to the man who gave me everything. Mark and I feel fortunate that, as the basketball coach for the University of Maryland, he can bring awareness and support to a disease set to escalate rapidly as the baby boom generation ages. We feel that we have been given this platform to help make a difference in the fight against Alzheimer’s. No one should have to watch their father or other loved ones suffer from this devastating disease. About the Author: Ann Turgeon, wife of University of Maryland Basketball Coach Mark Turgeon, assisted her mother in caring for her father, who had younger-onset (early-onset) Alzheimer’s. She shares her story here to let other families know they are not alone—and in hopes of inspiring more people to take action in the fight against Alzheimer’s. We had known for a little more than a month before we decided to let others in on the burden our family had been carrying. On the last day of school before Thanksgiving break, my husband, at age forty-six, stood before his beloved high school students and told them our horrific secret. We taught at the same high school, so I was able to be with him as his words first began to spill out during homeroom that morning. “I won’t be returning to school after Thanksgiving break, I am taking a medical leave,” he began. “I have an incurable brain disease and I am no longer able to continue in this job I love.” He never spoke the words “Alzheimer’s disease” that day, but he didn’t need to. The students knew what he was talking about. It was painful to stand beside him and watch as my husband of more than twenty years spoke to each of his six social studies classes that day. I could see the chins start to quiver and the tears begin to fall. There was a stunned silence. During that first class, after he told the students, a young lady came up and asked him so meekly, “I know you are my teacher, but for today is it okay if I give you a hug?” And thus began the long line of embraces from students. Some clung to their favorite teacher and sobbed—some of the toughest guys gave some of the most emotional hugs that day. Makeshift cards from students began to appear as the day went on, and alumni began to show up at his door. And so began our journey into the uncharted waters of living with Alzheimer’s at age forty-six. The day my sweet husband stood so bravely before his students to explain the onslaught of Alzheimer’s will always be a lasting memory to me of his strength, character, and resolve to do what was best for his students and family. I know he wanted to honor God with his honesty and integrity that day—and he did. Father’s Day – or any day, for that matter – is not a typical day for Jason. Jason is a teenage caregiver. While many young adults of 18 are thinking about final exams and high school graduation parties, Jason Hatke’s mind is looking much further into the future. At age 46, Jason’s father Mike was diagnosed with younger-onset Alzheimer’s disease. Jason was only 13. There were signs in the years before Jason’s father was diagnosed. In the 6th grade, Jason was in his school classroom viewing a video about Alzheimer’s with his fellow students. Jason immediately recognized the signs of Alzheimer’s shown in the video as behaviors his father had been displaying at home. He breached the topic with his mother Rita. Then, other issues began to surface. Mike’s boss noticed he had been experiencing trouble with his memory, especially in the afternoon hours after lunch. Soon Mike was seeing doctors to figure out what was going on. Two years and many tests later, the truth was revealed. Mike received a diagnosis of Alzheimer’s, and it changed the course of Jason’s life. As with all Alzheimer’s patients, scary situations arise and the reality of the situation is often raw and emotional. Jason manages to keep afloat while growing up a lot faster than his peers. “I feel like I am closer to 35 than 18,” he says. “Support from the Alzheimer’s Association and aid from other caregiver children coping with the disease has offered me a lot of comfort.” Jason has attended a ranch camp twice since his father was diagnosed. This is where he made new connections, supportive friends and where he met his girlfriend, whose father recently passed away with frontotemporal dementia. Although Jason feels a strong moral obligation to remain in Indiana to support his dad, he recently enlisted to join the Navy. That isn’t to say that he doesn’t worry about his decision. He does. He worries about the “what ifs.” What might happen when he returns? What if his father doesn’t recognize him? Like Jason, many caregivers and family members of people diagnosed with Alzheimer’s experie nce feelings of guilt. But Jason’s family is encouraging him in his decision and is committed to him pursuing his passions. His father insists that he won’t “weigh Jason down” by insisting that he stay in Indiana. Until Jason leaves for the Navy, he continues to live every day as it comes, taking to heart the many life lessons he is learning from his father — particularly his attitude toward Alzheimer’s. “He decided to step up and fight this disease. He advocates for progress and change and shares his voice on Capitol Hill. I respect my dad so much because of that,” Jason said. About Jason: Jason is sharing his story during Alzheimer’s & Brain Awareness Month in hopes that he can inspire others to get involved with the cause. He currently serves as an Ambassador for the Alzheimer’s Association, recently attending the Alzheimer’s Association Advocacy Forum for the third time. He is also working on launching a dementia website of his own. With that brief pronouncement, my world, my husband’s world and our children’s world changed forever. My husband Jim was 48 when we heard those words. I was 40. Our daughter was 9 and our son was 6. I started to separate myself from Jim and the disease to the point that I became almost businesslike. Researching, interviewing doctors, contacting the Alzheimer’s Association – I was just trying to figure out what was happening and what kind of timeline we were on. I soon found out that there is no timeline. In fact, no two patients have the same symptoms at the same time, in the same order or on the same schedule. It makes for an isolating and desperate feeling. With two young children at home, I was unable to wallow in my self-pity. I am no longer afforded the luxury of thinking too far ahead, dreaming of a life enchanted. Luckily we are an active family with hectic schedules; this helps me focus on my to-do list and not on our plight. I have slowly developed an awareness of the new Karen. The old Karen liked to think of herself as a giver, and she was to a certain point. But the new Karen must constantly be giving to Jim, the kids, to others. And it feels good. Lifting my head off my pillow, pushing away the covers and facing the day ahead of me takes every ounce of self-motivation I can muster. But if I don’t, I won’t get paid, the kids won’t have breakfast, their lunches won’t get made and they won’t make it to school. It is a cycle, and everyone lives it. Slowly – very slowly – I have pulled myself out of the fog, out of the darkness. Don’t get me wrong; I still have moments of sheer terror and obliterating pain. But I have found my life again. I thought I found my life when I met Jim. Then I thought I found my life when I had each of my children. But I think I was always trying to figure out what my true calling was. I felt I had a purpose, but it eluded me until this past year. I started by doing advocacy work with the Alzheimer’s Association in Washington D.C. That led to some interviews about the disease. 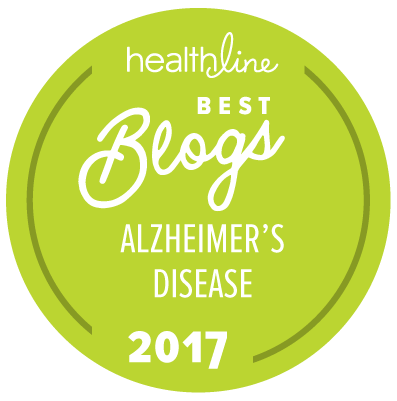 Then, with encouragement from friends, I started writing a blog chronicling our path through younger-onset Alzheimer’s. Emails started pouring in, then more speaking engagements and interviews. Suddenly I realized I had found what I was looking for. I was looking for my life’s calling and this was it. It wasn’t what I would have ever expected or guessed or hoped for, but it is my calling all the same. Jim’s mother and brother died of Alzheimer’s disease, so it doesn’t take a genius to realize our children have a high probability of also succumbing to this hideous malady. There is my motivation. There is where my strength starts and ends. I don’t feel as if I am going through a mid-life crisis as much as I am going through a mid-life awakening. Life is so much different since our world became engulfed with all things Alzheimer’s. I feel like a small pilot light inside of me has now been ignited and is ready to spread like a wildfire. No day is the same and no day is easy. There are days when Jim barely acknowledges me or our kids. He is in his own world. It is hurtful. It is lonely. It is heartbreaking. And I know it’s only going to get worse. Luckily, I know I am not alone. I think of what I am going to do to help others. By helping others, I will help us. It is a continual shifting back and forth, like water in an eddy. There is a sense of duty and a sense of awareness that I have never felt before. It empowers me to not only get out of bed and make it through my day, but to do it with a sense of purpose, with an understanding of pain, and the ability to feel powerless against a force I have no control over. There is no way of knowing when it will be felt or when it will strike a new low, but if I were to let myself lose focus of the bigger picture, I would be crushed under the weight of uncertainty that is equaled out by a certainty of what is to come. I am strong. I am weak. I am a caregiver for a man with younger-onset Alzheimer’s disease. I will survive. It may not be pretty. It may not be quick. It may cost me everything I cherish, but I will survive with the help of friends, family, strangers and myself. I must survive for my children and for other caregivers that are struggling just as I am. We will all survive together, knowing that we are not alone. Feel the love and the power of others rooting for you to endure. “This Is Our Life” is the final line of a production entitled “Resurrection” that my husband Steve and I have been a part of with our church singing group for the past 17 years. During the last song, everyone in the congregation holds a candle that is lit from a single candle that stands alone on the altar. As each candle is lit, we watch the church go from dark to light. The first year we performed, a small group of us got together and pitched in—sewing costumes, rehearsing and doing whatever was necessary to make it happen. Almost two decades later, there are more than 100 people in the cast. The experience has taught us that when people come together, the illumination is very bright. This summer, on June 21, my husband, our family, our friends, and community will stay in motion from sunrise to sunset as a way of showing our commitment to a day when Alzheimer’s is no more. It’s part of The Longest Day, an all-day event to raise awareness and funds for Alzheimer’s care, support and research. We’ve named our team “This Is Our Life” because we believe—similar to watching the church go from dark to light during the performance —if we all work together, we can illuminate the darkness of Alzheimer’s. The more people willing to tend to the light, to spread awareness about Alzheimer’s and to get involved, the closer we come to a time when Alzheimer’s doesn’t exist. Alzheimer’s is no stranger to our family. Last year, right before his 59th birthday, my husband Steve was diagnosed with early-stage, younger-onset Alzheimer’s. Five years earlier, his mother was diagnosed with Alzheimer’s. In a way, Steve’s diagnosis is a gift. Because we have this knowledge, we don’t waste a minute. We know this time is sacred. Steve’s quality of life is good—and we are living every day. After receiving a diagnosis of Alzheimer’s, there is so much you feel like you can’t do. There currently aren’t treatments to stop this horrible disease. There is no cure. But being part of The Longest Day is something we can do. It is empowering to have this tangible event where we can take action. And it’s action that really matters.The nearly $12,000 we raised last year helps support Alzheimer’s programs and care, and furthers the Alzheimer’s research going on throughout the world to try to find better treatment and a cure. For us, the event is also about community. At the end of The Longest Day last year, we felt better about the future than we did at the beginning of that day. Every donation came with a note of support and love. At sunset, 30 people gathered at our house for a celebration of all we accomplished. This year, we hope to have 50—or even 100. When you bring people together, for important causes, unbelievable mountains can be moved—and our amazing community has shown us that they are here with us on this journey, that IS Our Life, until a day when Alzheimer’s is finished….or is just a memory! Judy Johanson is care partner for her husband, Steve, who was diagnosed with younger-onset Alzheimer’s at age 59. Together with her family and friends, Judy is participating in Alzheimer’s Association The Longest Day®, a sunrise-to-sunset event on June 21, 2013, to raise awareness and funds for Alzheimer’s care, support and research. It is officially fall and fall means football season – fans, cheerleaders, Friday night lights, afternoon tailgaters, Monday Night Football. When we think of football – we think of the gladiators of the gridiron. However, one of the best football games this season is being played by women across the country – and they are playing to win the battle against Alzheimer’s disease. Sara Allen Abbott and her sister, Kate Allen Stukenberg, are two beautiful brunettes born and bred in Texas. Their love of football is both geographically influenced (what Texan doesn’t love football?) but also a family affair. Their mother started the Powder Puff football game at the girls’ high school that helped raise funds for an after-prom program. Their father, Joe, had always been a football fan cheering on his favorite team, the Houston Oilers and taking both daughters to games at the Astrodome from a young age. Both sisters also recall fond memories of how their dad indoctrinated his daughters into “game day” by taking his girls to University of Texas games to cheer on the Longhorns, where both women are now alumnae. Sara on her wedding day with her dad Joe who had already been diagnosed with Alzheimer’s disease. In 2005, Sara and Kate’s dad was diagnosed with younger-onset Alzheimer’s disease. He was only 63 years old, although Kate remembers that there were small signs of the disease several years earlier. And, although it was Sara and Kate’s dad who developed the disease, The Shriver Report: A Woman’s Nation Takes on Alzheimer’s released last year from the Alzheimer’s Association shows that 10 million American women are touched by Alzheimer’s disease and other dementias. Of the more than 5 million Americans diagnosed with Alzheimer’s disease, two-thirds are women. In addition, 6.7 million women represent 60 percent of the family caregivers of those living with the disease. It was that conversation that she believes inspired her to do something to fight Alzheimer’s disease. Kate Allen Stukenberg (second from right) brings Blondes vs. Brunettes® to Houston. The age-old hair color competition (blonde or brunette?) helped fuel Sara’s idea to raise funds for the Alzheimer’s Association through a very non-traditional event. In 2005, Sara approached the Alzheimer’s Association with the idea of tackling Alzheimer’s in a new venue – on the football field with all female players. The first flag football game, Blondes vs. Brunettes®, was played in Washington, D.C. and a winning event was born. It took Sara’s sister, Kate, only six months to take a page out of Sara’s playbook and host her own Blondes vs. Brunettes® game in her Houston community. In its seven-year history, the Blondes vs Brunettes® games have raised over $3 million for Alzheimer’s research and programs. The events now span from coast-to-coast, with more than 25 cities set to host a game in 2013. To find local events this fall, visit the Alzheimer’s Association Website (www.alz.org). And, to prove they are democratic, Sara and Kate have invited men to serve as coaches, umpires, announcers and even cheerleaders. When I asked the sisters what they felt their dad would say about their fund-raising and awareness-raising success, they both replied he would be proud but then they shine the spotlight back on their beloved dad. Kate replied that she runs into people all the time who tell her how much he wanted to help people, what a character he was and what a difference he made. Now it’s the sisters making a difference. And, what a beautiful legacy of their dad that his girls are doing “amazing things” by honoring his love for the game.